The whole point of betting on horses - betting on anything - is being able to accurately predict what will happen in the future. The more 'yesterday' information we have, the better able we are to forecast 'tomorrow'. In Britain, horse racing punters were traditionally in the dark: for years, there was nothing more informative (ahem) than the little alphanumeric sextet of recent finishing positions to the left of a horse's name. 'Professionals' bought the Sporting Life and, more recently, Racing Post. This gave them a huge leg up on other newspaper readers, but was still seriously deficient in terms of projecting what might actually happen in a race. The advent of the internet has, slowly it must be said, changed things; finally, punters are able to access a raft of insightful data which genuinely can give them the edge over the bookmakers. This edge is greatest in the early markets, where many of the horse race odds lines are algorithmically constructed: Deep Blue versus Kasparov this is not. The software creating the early markets is not exactly sophisticated, which means we don't need to be chess grandmasters to find the ricks. Looking at past form cycles and profiles - that is, when a horse comes into form and under what conditions - is a blind spot in the algos, which focus too heavily on recent form. The starting price markets are much more efficient of course, but nobody bets SP, do they? Do they?!! One of the last major vestiges of unpublished form, in Britain and Ireland at least, is pace. Pace can mean different things: it can be precise, by virtue of sectional times; or it can be more general, defining a horse's run style. In most of the established racing betting nations - Hong Kong, Japan, US - sectional times are ubiquitous. Commentators are able to quantify the speed of the horses in-running by a split time stopwatch in the corner of the screen. Geegeez Gold has had pace information, in the form of a data table, for quite some time. And, yesterday, we moved things up a notch by converting the numbers into a picture: a pace map. Pictures are much easier for us humans to understand than words and numbers. Consequently, we can get the gist of something - like, for example, how a race will be run - in just a second or two when the data is presented in pictorial format. 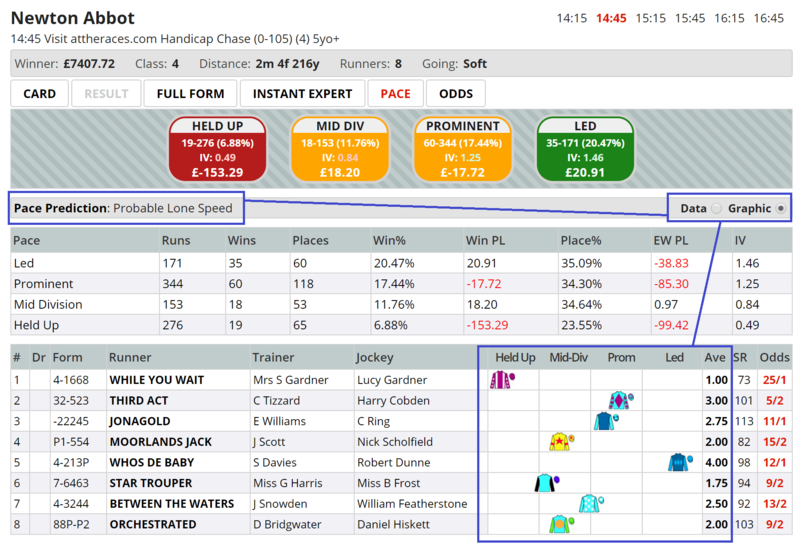 So, welcome to Geegeez Gold's new Pace Graphic view. It's not Deep Blue, and nor was it imagined by the genius of Kasparov (it was me, actually), but it does instantly visualise how a race might be run based on the last four UK/Ire runs of the horses in it. And that means its users have a significant edge on other punters, either in time or awareness terms or, in most cases, both. In this example from yesterday, Whos De Baby was predicted to be 'Probable Lone Speed', meaning he was expected to be able to set his own pace and try to make all. He very nearly did, finishing a good second at odds of 12/1. Below is a video where I show you the what and how of the new Pace Graphic. If you're familiar with pace and how to use it in horseracing there may be little new therein. But if you're still trying to get to grips with the importance of pace, and which scenarios to look out for, you really should watch it. There is more information in the User Guide, which can be downloaded from your My Geegeez page here; and there is an 'introduction to pace' video here. Geegeez Gold continues to be committed to provided the best information for punters in the most consumable, readily understandable format, so you know more than your competition (other punters, not bookmakers) in less time. Good luck, and thanks for reading/watching. This looks like a fantastic addition to the Geegeez suite. As someone who builds reports and delivers statistics, trends and data analysis for a career, I can attest to the power of visuals for delivering meaningful information as quickly and efficiently as possible. I have no doubt this will be an incredibly useful tool. Pace graphic is a great addition Matt…..something i have to admit i struggled with but the graphic is like a mist clearing for me….keep up the great work..
I’ve just checked this out and can’t see the radio buttons on the Pace view. I have logged in using another browser and when the screen initially switches to the Pace tab, I see the buttons but within 1-2 seconds it reverts to the previous ‘Pace Prediction’ to the left hand side and the radio buttons have disappeared. Has anyone else reported this? It looks like there is a problem with iPads and the cache in Chrome. I’ve cleared the cache on my test iPad but the issue still manifests. I admit to be clueless with (and hating) Apple devices, but it really should be quite simple to do a ‘hard refresh’. Thus far, I’ve failed to work out how, even having called in the massed ranks of Google. Any help from Apple gurus much appreciated. I was able to refresh very easily in Safari by just tapping the refresh icon in the address bar. p.s. Yes, yes, I know my dislike for Apple is irrational. It stems from the proprietary nature of their business model. iTunes, broken screen, etc – all roads lead back to Apple. It’s a totalitarian business regime, and not my thing. They do look pretty, mind. If you’ve followed the instructions in the link I posted in reply to your previous comment, then do email us and we’ll investigate further. I have the same issue as Colin, I use an iPad, if you get a solution, please forward on. Please follow the instructions in the link above in the comments. I watched your video this morning and interestingly you highlighted Hallings Comet at Worcester which won at 4/1. I had picked it out as a possible before watching your video but that tipped the balance. go to settings and clear your browser. worked for me. Hi Matt – I really like the pace data ( brilliant tool to use in various ways particularly in sprints) and the visual picturing will be useful. Will users still be able to see the numeric data as you currently publish ? PS Been using the site for a month or so now. It’s been a great tool enabling me to have more consistent success due to the consistency and breadth of data available. Cheers! Yes, the data view is still there. Just click the radio button to the right of the Pace Prediction line. More detail is on page 36 of the User Guide, which can be downloaded from your My Geegeez page. p.s. really good to hear you’re having more consistent success thanks to Gold – that’s great news!